A 55-year-old Caucasian man who worked in the recycling industry presented with a 7-month history of non-productive cough and no other symptoms. He had no significant previous medical history and took no medications. He had never smoked and had no history of travel outside the UK. He described symptoms of a lower respiratory tract infection 5 months previously which had been treated with antibiotics and steroids. A chest x-ray at the time had shown consolidation consistent with infection which had subsequently resolved. Physical examination was normal. Spirometry and transfer factor were normal. Full blood count showed isolated eosinophilia of 12.7×10−9/l. The blood film revealed an unremarkable cell morphology. The erythrocyte sedimentation rate was elevated at 92 mm/h. Urea and electrolytes, liver function tests and serum immunoglobulin E (IgE) were normal. Aspergillus precipitins, antineutrophil cytoplasmic antibodies, rheumatoid factor and antinuclear antibodies were negative. Stool culture and microscopy were negative. A repeat chest x-ray was normal but a high-resolution CT scan showed bilateral patchy bronchocentric consolidation (figure 1) and mild splenomegaly. Bronchoscopy revealed no endobronchial abnormality with negative results for culture and cytology. 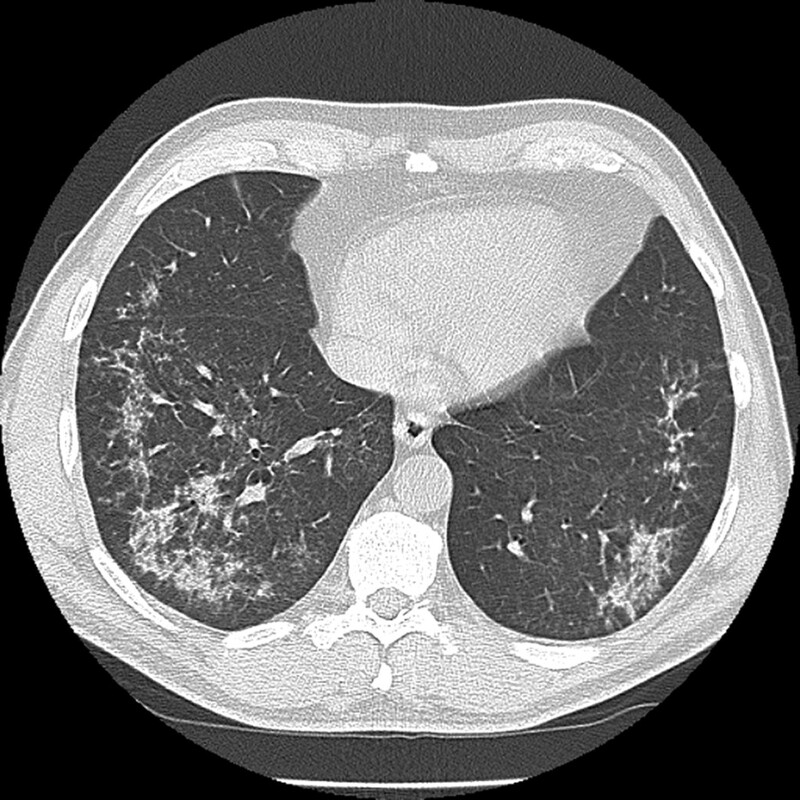 High-resolution CT scan showing bilateral patchy bronchocentric consolidation. The patient's cough became so debilitating that he was unable to work. His eosinophil count rose to 18×10−9/l and he was referred for haematology review. A bone marrow trephine was performed and peripheral blood was sent for cytogenetic testing which gave the diagnosis. Within 2 weeks of commencing treatment his cough had resolved and his eosinophil count was 0. What is the diagnosis and what treatment caused his dramatic clinical improvement? The mechanism for cough in CEL is unknown. We did not demonstrate eosinophilic lung infiltration (no bronchial biopsies or bronchoalveolar lavage were performed), but suggest that the pulmonary infiltrates seen on the CT scan represent eosinophilic infiltration. This would be consistent with a case of FIP1L1/PDGFRA-related disease who presented with cough,6 in whom CT scanning showed thickened airways and endobronchial biopsy showed eosinophilic inflammation. The patient also had normal spirometry and a negative histamine challenge test but a sensitive cough response to inhaled capsaicin. We hypothesise that eosinophils or their degranulation products are the cause of the cough, but further studies are required to elucidate exactly how eosinophils induce cough.
. Chronic eosinophilic leukaemia and the hypereosinophilic syndrome. In: Jaffe ES, Harris NL, Stein H, et al., eds. World Health Organization classification of tumours: pathology and genetics of tumours of haematopoietic and lymphoid tissues. Lyon, France: IARC Press, 2001:29–31.
. Tropical pulmonary eosinophilia. Annu Rev Med 1992;43:417–24.
. A tyrosine kinase created by fusion of positive PDGFRA and FIP1L1 genes as a therapeutic target of imatinib in idiopathic hypereosinophilic syndrome. N Engl J Med 2003;348:1201–14.
. The FIP1L1-PDGFRA fusion gene cooperates with IL-5 to induce murine hypereosinophilic syndrome (HES)/chronic eosinophilic leukaemia(CEL)-like disease. Blood 2006;107:4071–9.
. Molecular mechanisms underlying FIP1L1-PDGFRA–mediated myeloproliferation. Cancer Res 2007;67:3759–66.
. Cough and hypereosinophilia due to FIPL1-PDGFRA fusion gene with tyrosine kinase activity. Eur Respir J 2006;27:230–2.